Sandwiches are super quick to prepare and very tasty to eat. Though I got used to liking and loving bread in the later years of my life, it’s such a savior. Making sandwiches is one of the healthiest and easiest dinner options. 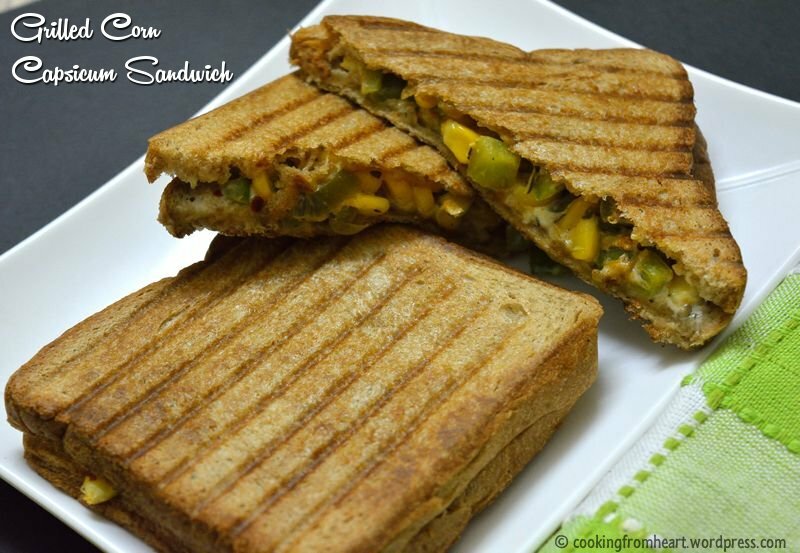 All you need are a few vegetables, some eggless mayo, some spices – put everything together – yummy sandwich is ready. There are times I give into the temptation and make cheesy sandwiches. Couple of weeks back, I had the most amazing cheesy grilled corn sandwich and I fell in love with it. Cheese and Corn go hand in hand right?! That would be a recipe for some other day. Today’s recipe is a low cal sandwich which would be perfect for a weekday’s dinner. Most of you know how I have frozen sweetcorn at my home all the time. They come in very handy at times like these. 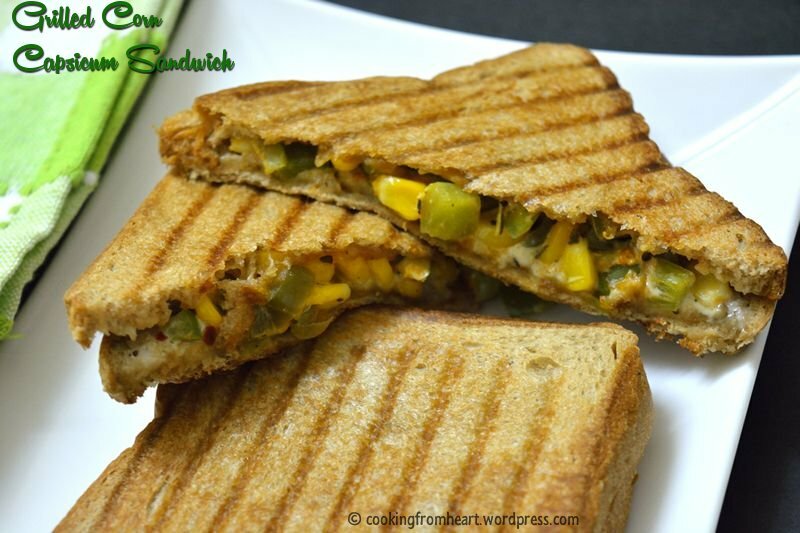 I microwaved finely chopped capsicum and frozen sweetcorn, added the spices and grilled the sandwich. 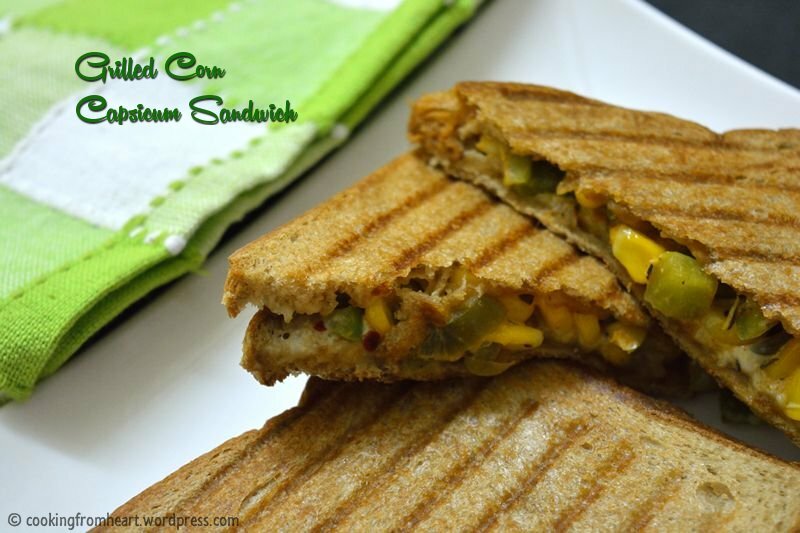 If you are not calorie conscious, grated cheese can be added but this sandwich is yummy as it is. It can be served with tomato ketchup or potato chips or a hot bowl of soup. 1. In a microwave safe bowl, add finely chopped capsicum and sweetcorn kernels. Microwave high for 3-4 mins. 2. Add salt, oregano spice mix, red chilli flakes, paprika powder and finely chopped jalapenos. Mix well. 3. Take two slices of bread. Spread butter/oil on a side of the bread. On the other side, spread the eggless cheesy garlic mayo. 4. Meanwhile heat the grill or the sandwich maker. Spread the corn capsicum mix on the mayo spread bread. Close it with the other piece of bread. 5. Grill on the sandwich maker until both sides of the bread are golden brown. 6. Serve hot with tomato ketchup or potato chips on the side. Instead of microwaving, the sweetcorn and capsicum can be cooked on the stove top as well. The butter or oil is optional. When added, gives crispness to the sandwich. Additionally grated cheese can be added in the filling. For the Oregano Spice Mix, you can use the ones you get with Domino’s or Pizza hut’s Pizzas. The Jalapenos gives a tangy punch to the filling. If not available, can be skipped. Super yummy sandwich and easy! Thanks!